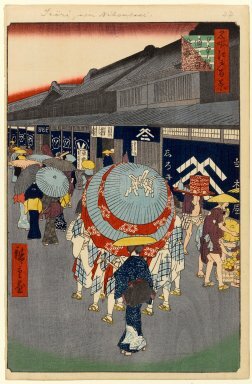 This scene is in the middle of the main street in Edo, on a hot summer day; most of the people are under hats or parasols to escape the sun. The older man on the right is eating a yellow Makuwa melon and beyond him to the left, a delivery boy is almost hidden by his tray load of noodle boxes from the sboa shop Tokyoan (the white noren in center). A group of Sumiyoshi dancers are under a huge two-tiered parasol. Originally, the Sumiyoshi dancers were seasonal minstrels from Sumiyoshi Shrine, near Osaka, who would perform celebratory shrine dances in return for donations. The five dancers here are wearing their costumes of straw materials, red aprons, white fans and sedge hats, topped by the blue parasol with red shashes and white "gohei." Following the dancers is a female street minstrel, the "onna-dayu," who along with others would sing to shamisen accompaniment. The onna-dayu were from the outcast "hinin" class and were always followed at a distance by a husband or father. It was suggested by Miyao Shigeo that this woman following the Sumiyoshi dancers might be their samisen accompanist. The street scene here is the cotton sellers district, occupied by merchants from the Omi region. The Sumiyoshi dancers were traditionally dressed in cotton; the onna-dayu were prohibited by class barriers from wearing silk but were known for their stylish cotton kimonos, as seen here, closely fitted and wearing high "geta" clogs. The large store to the right is Shirokaya, founded in 1662 and one of Tokyo's great modern department stores, now part of a Tokyo chain.